Logan's Run is a 1977 American television series, a spin-off from the 1976 film of the same name. 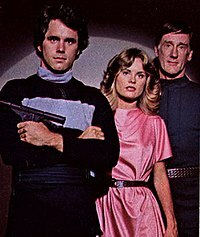 The series starred Gregory Harrison as title character Logan 5, and Heather Menzies as Jessica 6. The series maintains the basic premise and visual style of the film in that Logan and Jessica have escaped from the "City of Domes" so that they will not have to die once they reach the age of 30. However, the series differs from the plot of the movie in various ways, and depicts Logan and Jessica on the run in each episode in various locations on future Earth as they search for the mythical place known as "Sanctuary". Logan and Jessica are also assisted in each episode by an android called Rem (Donald Moffat) who did not appear in the film version. The series lasted only 14 episodes before it was cancelled. The series depicted Logan and Jessica escaping from the City of Domes only to be pursued by Francis (Randolph Powell) and various other Sandmen. Traveling in a futuristic hovercraft-like vehicle which they find in an abandoned building in the remains of Washington DC, they embark on a trek through post-apocalyptic United States in order to find Sanctuary. On their journey, they encounter strange human societies, robots, and even aliens. The domed city (including Carousel) was seen only in the pilot and two other episodes, using recycled footage from the film. In a change from the book and film, the television series had the city secretly run by a cabal of elderly citizens who promised Francis a life beyond the age of thirty as a city elder if he can bring back the fugitives. Logan and Jessica were joined on their journey by an android named Rem (played by Donald Moffat), whom they come across in a futuristic city run by robots. In a 2017 interview, Heather Menzies stated that Dirk Benedict and her Sound of Music co-star Nicholas Hammond also auditioned for the role of Logan 5. When asked for her opinion on the series' quick demise, she replied: " I think they needed to spend more money on the visuals. Star Wars came out around that time and we couldn’t really compete with that." D. C. Fontana served as story editor and worked alongside several other writers from Star Trek as well as one of the original novel's authors. Executive Producers of the TV show were Ivan Goff and Ben Roberts, who had created Charlie's Angels the year before. The pilot episode, which began with a condensed retelling of the original film's concept was written by William F. Nolan, co-author of the original novel, with Saul David, the original producer of the film and the TV series (until he was dismissed), and series producer Leonard Katzman. When the pilot was presented to the network, CBS asked to have part of the pilot re-shot with changes to the plot, including the introduction of a cabal of city elders who secretly ruled over the Domed city. This change alters Francis 7's motivations for pursuing Logan; in the original film, his intent is to kill Logan for betrayal, but due to the introduction of the cabal, Francis is offered by them the chance to live beyond age 30 as a reward for bringing Logan and Jessica back to the city. Goff and Roberts were brought on board by MGM when original producer of the TV show (and producer of the film) Saul David was fired from the project and the pilot episode went through reshoots, rewriting and re-editing prior to being green-lit for production as a series. The line producer for the series was Leonard Katzman. Fontana commissioned Harlan Ellison to write a treatment for one episode ("Crypt" which was heavily revised) and David Gerrold to write a teleplay ("Man Out of Time"). Gerrold's script was rewritten by someone else, prompting Gerrold to use his nom de plume "Noah Ward" (a homonym of "no award") on the episode. The series' main theme tune was composed by Laurence Rosenthal. The series used the costume designs for the Sandman uniforms and recycled the guns used in the original film. Mort Rabinowitz worked as the art director on the film assisted by set decorator Linda De Scenna. The pilot episode also featured heavy use of the miniatures and visual effects from the movie, most notably footage from the "Carousel" sequence, although the demises of the participants were redone to be less violent. The hovercraft vehicles used for the film were designed by Dean Jeffries Auto Styling. These vehicles were used in other TV shows after the cancellation of the series, including CHiPs, and were used in movies such as Spaceballs and Ice Pirates. The Ground Car was used in the music video for Tom Petty's "You Got Lucky." The vehicles were also rented out for use in a number of low-budget films. Roy Hayes Visual Effects did the visuals specific for the series. The film is set in the year 2274. The series begins in the year 2319. In the film, the city in which Logan and Jessica come from is simply referred to as "The City". In the series, they refer to it as the "City of Domes". In the film, each citizen of the City has a lifeclock crystal implanted in the palm of their hand at birth, which changes color as they get older and blinks as they approach 30. The lifeclocks were not seen in the series. Logan's motive for leaving the City of Domes is different. In the film, the City's computer makes his lifeclock blink early and sends him on a covert mission to find and destroy Sanctuary. In the series, Logan begins to question Carousel and the need to die at 30, and decides to run by himself. In the film, participants in Carousel were seemingly shot and killed in a shower of sparks (like a laser blast). When they are killed in the series, they glow and are vaporized. In the film, the City is run by a computer. In the series, it is run by a secret cabal of old men. Francis 7's motive for chasing Logan is completely different; in the series, the reality of Carousel is revealed to him by the cabal, and he is offered the chance to join the elders and live beyond age 30, provided he capture Logan and Jessica alive so that they can be "reprogrammed" and made to denounce the existence of Sanctuary, preserving the status quo in the city. In the series, the Sandmen are given vehicles with which they can travel outside of the City to pursue Runners. In the film there were no vehicles that travelled outside of the City. The solar-powered hovercraft vehicle that Logan and Jessica find and use was not featured in the film either. The character of Francis 7 was killed in the film version, but lives throughout the series. The character of Rem is unique to the TV series. Although suggested by the robotic film character of Box, Rem owes more to the android lead character of The Questor Tapes, a film for which story editor D.C. Fontana wrote the novelization several years earlier. 75-minute pilot episode: In the 24th century, survivors of a nuclear war live in a domed city where they are allowed to stay alive only until age 30. "Runners," who refuse to die in the extermination ceremony known as Carousel, are hunted down and killed by enforcers called Sandmen. Logan is a Sandman who's begun to question the system, and he and a woman named Jessica leave the city to look for a mysterious place called Sanctuary. Along the way they meet an android named Rem, who joins them in their quest. The three of them are being pursued by a Sandman named Francis. Logan and Jessica are abducted by John the Protector and Joanna, aliens from another planet who are manipulating their minds, making them believe that they have found Sanctuary. But they are not alone in their captivity. A hunter named James Borden (Horst Buchholz) and his wife capture the Runners and Francis. Now all of them have to run from the new hunters, who enjoy the chase. Logan, Jessica and Rem encounter a young woman named Lisa, whose parents left her alone with only two robots for company. Lisa has a crush on Logan and plans to get rid of Jessica so she can have him for herself. Scientist David Eakins time-travels 200 years into the future, where he encounters Logan, Jessica and Rem. He then plans to change history and prevent the nuclear war, but in the process he could erase the Runners world's existence. Logan, Jessica and Rem are attacked by two bands of duplicate humans with vastly different temperaments: one group is kind and gentle while the other is violent and vicious. Jessica is captured and split into two different persons with completely opposite temperaments. The Runners find an underground room with six selected survivors of the nuclear holocaust, chosen to rebuild civilization, cryogenically preserved. They need a cure for a plague from the past, but there is not enough medicine for all of them. The Runners are captured by scientists of an authoritarian, concealed city who plan to use Logan in their experiments, in order to remove all human fears and to create a powerful army. A Sandman is given plastic surgery to appear as the runner, Hal 14 (Nicholas Hammond), one of Jessica's friends. He is sent on a covert mission to try to persuade Logan and Jessica to return to the City to supposedly help other Runners escape to the outside world. Trivia: This was a reunion of actors Nicholas Hammond and Heather Menzies. They both starred in The Sound of Music as brother and sister, Friedrich and Louisa von Trapp, respectively. Logan and Jessica are accidentally put to sleep by a dream analysis machine controlled by a female android named Ariana. Logan dreams he is back in the City of Domes being interrogated by the Sandmen about how he found Sanctuary, and Jessica dreams she is being forced to take part in Carousel. "Carousel" Irving J. Moore Story by : Richard L. Breen, Jr. Strangers shoot Logan with a dart containing a serum that erases his memory. Francis then takes him back to the City to testify against Sanctuary and to be terminated via Carousel. Jessica and Rem try to save Logan and retrieve his memory. The Runners stop at a house haunted by spirits from another time. Jessica is captured so that one of the spirits can use her as the receptacle for his dead wife's spirit. The Runners are captured by backward desert dwellers and condemned to death. Francis attempts to rescue Logan and Jessica. The Runners encounter aliens from a much hotter planet who need parts from Rem to bring others of their kind to Earth. Only the first eleven episodes of the series were broadcast on the West Coast during its original run. Despite its brief run, the show was sold overseas. It was shown in the United Kingdom by the ITV network in early 1978, though times varied per region. The Mego Corporation had planned to release a line of Logan's Run toys in conjunction with the series. Prototypes were made for several 9" action figures, but the cancellation of the show prompted Mego to change their minds and cancel production. The complete run of the series was released by Warner Home Video on Region 1 DVD on April 10, 2012. ^ Armstrong, Richard (November 27, 2017). "Interview with Heather Menzies Urich". Classic Film & TV Cafe. Retrieved December 17, 2017. ^ Lambert, David (December 16, 2011). "Logan's Run - Package Art and Amazon Pre-Order Link for 'The Complete Series' DVDs". TVShowsOnDVD.com. Archived from the original on March 1, 2016. Retrieved May 15, 2014.